Hispanified Day is an event for celebrating Hispanic Heritage hosted by the Center for Hispanic Marketing Communication, aiming to introduce Hispanic heritage and culture from a more diverse and comprehensive perspective. There will be an amazing movie, named The Book of Life, on campus on October 24th from 9:30 am to 12 pm at FSU Student Life Cinema. 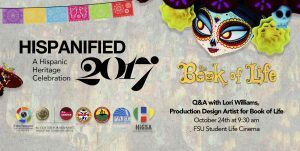 We have our honor to invite Lori Williams, the production design artist for The Book of Life, to have a Q&A session after the wonderful movie time. The Book of Life is a 2014 American 3D computer-animated musical fantasy adventure comedy film produced by Reel FX Creative Studios and distributed by 20th Century Fox. Based on an original idea by Gutierrez, the story follows a bullfighter, on the Day of the Dead, who embarks on an afterlife adventure to fulfill the expectations of his family and friends.